The Stabilised Horizon Reference System provides the pilot with a real time reference of the ship’s roll motion relative to the horizon. 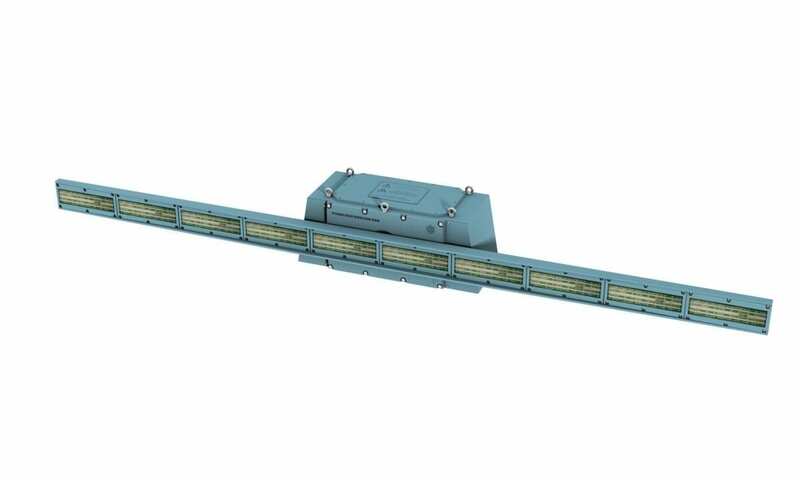 The STABILISED HORIZON REFERENCE SYSTEM (SHRS) is an illuminated bar that remains horizontal irrespective of the ships roll motion. This provides the pilot with a “True Horizon” reference whilst those lights fitted to the ships superstructure continue to show the ships actual angle of roll. The SOLID STATE STABILISED HORIZON REFERENCE SYSTEM (SSSHRS) has no mechanical moving parts. The two reference arms at each end of the bar contain LED indicators which are switched (in response to the gyro input) to indicate the true horizon. The reference bar is fixed to the ships superstructure and indicates the angle of the deck relative to the true horizon. PILOT VISUAL CUES (PVCs) can be used in conjunction with the Horizon Bar in order to indicate final positioning while hovering above the flight deck prior to touchdown and capture by the ASIST system.